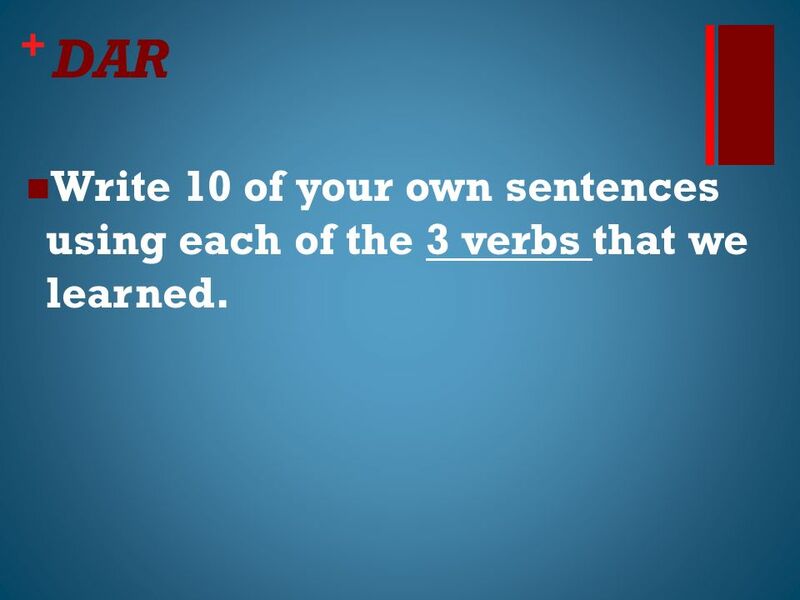 19 + DAR Write 10 of your own sentences using each of the 3 verbs that we learned. 23 + Surrender on 6 Pick a group of four people to work with. 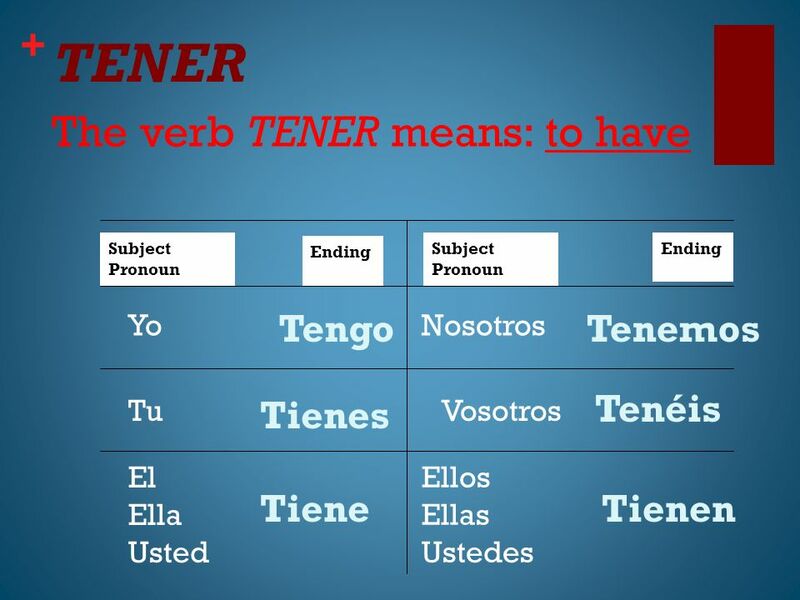 Each person should have a verb chart. There should only be ONE writing utensil for the whole group. 24 + Surrender on 6 The first person rolls the dice. If they do NOT roll a 6, they have to pass off the die. 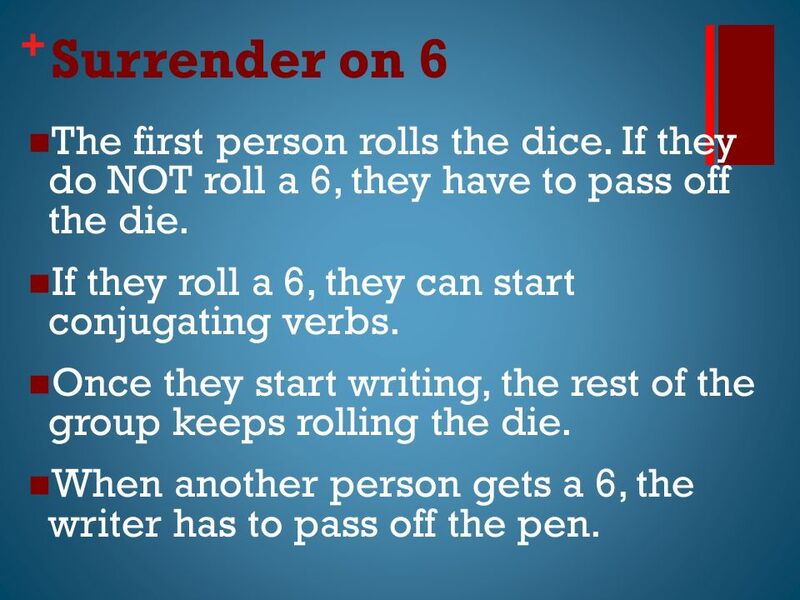 If they roll a 6, they can start conjugating verbs. Once they start writing, the rest of the group keeps rolling the die. 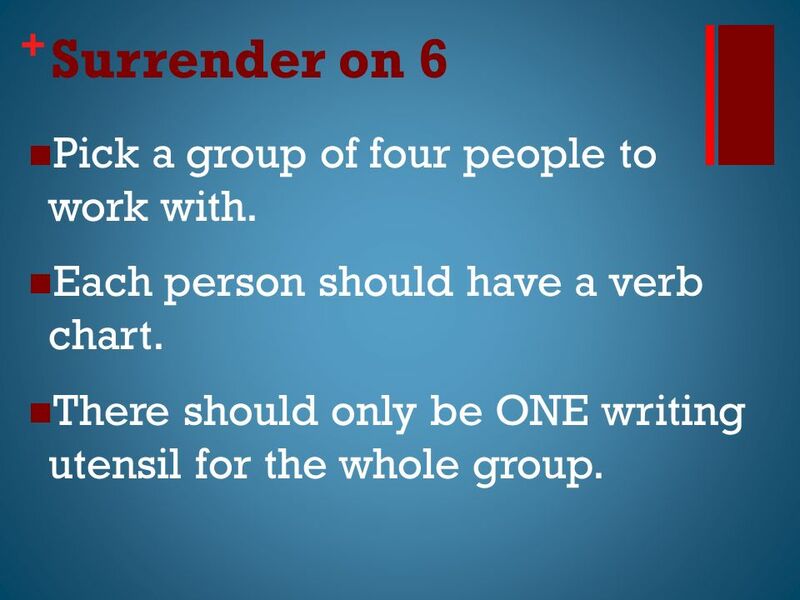 When another person gets a 6, the writer has to pass off the pen. 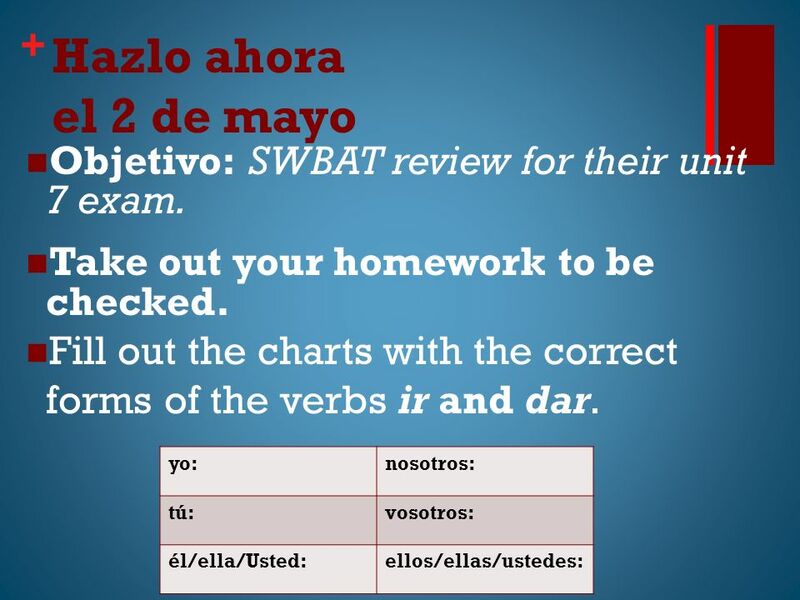 25 + Hazlo ahora el 3 de mayo Objetivo: SWBAT review for their unit 7 exam. 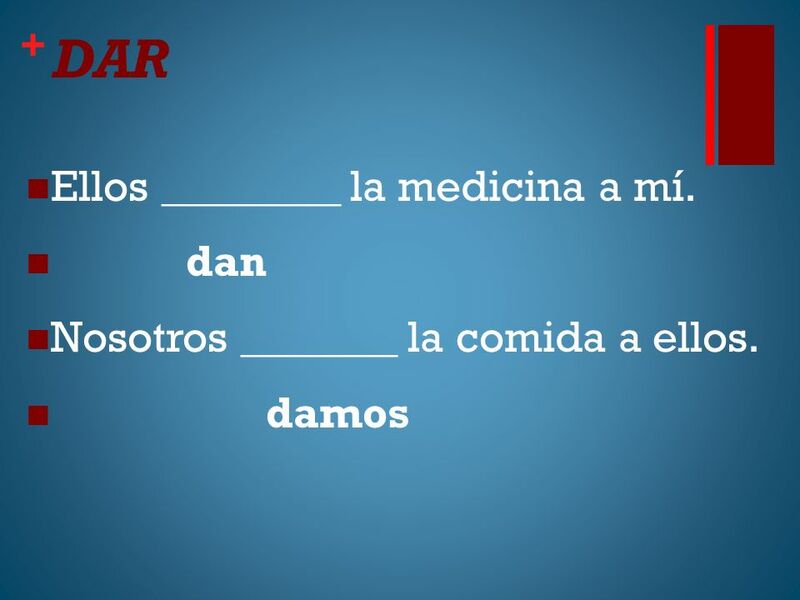 Fill in the blank with the correct form of the verb in parenthesis. 1. 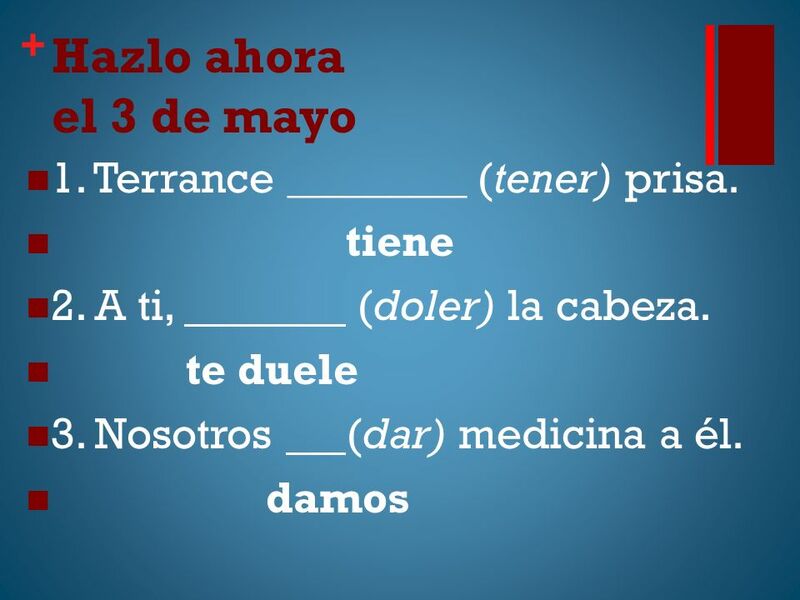 Terrance ________ (tener) prisa. 2. 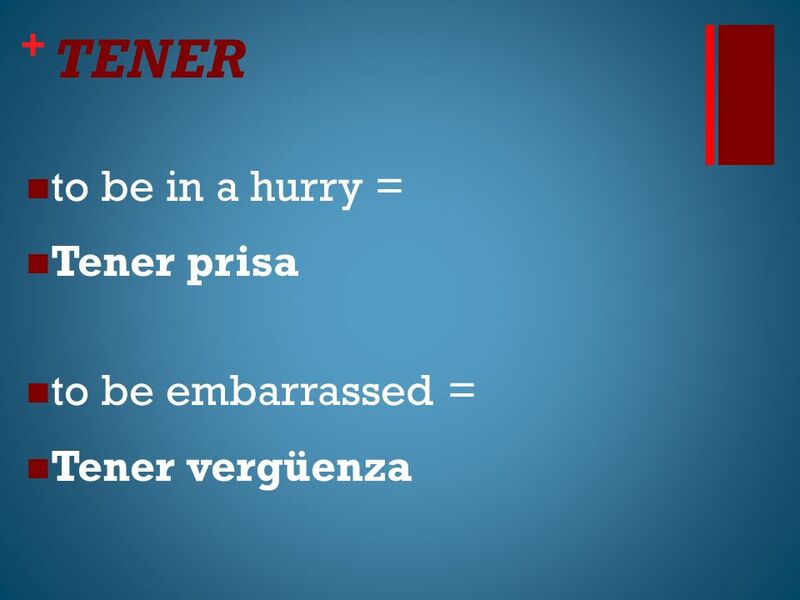 A ti, (doler) la cabeza. 3. 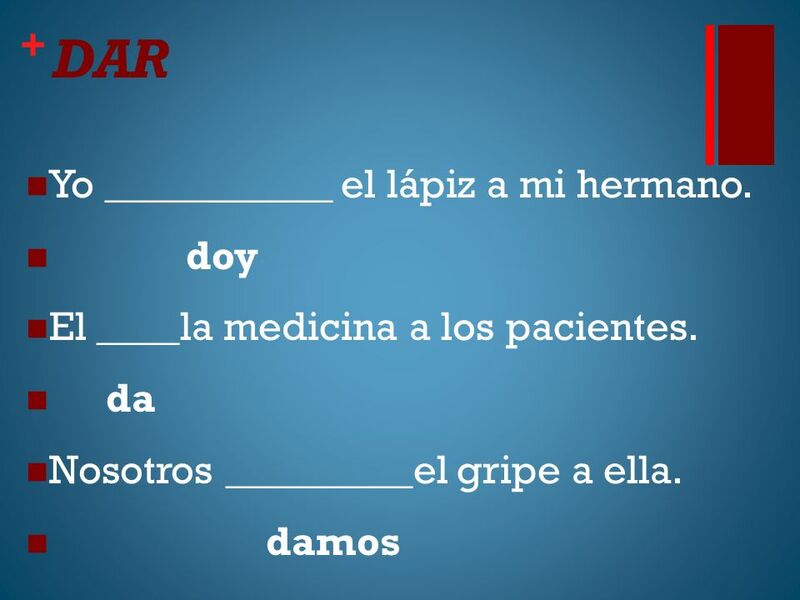 Nosotros (dar) medicina a él. 4. 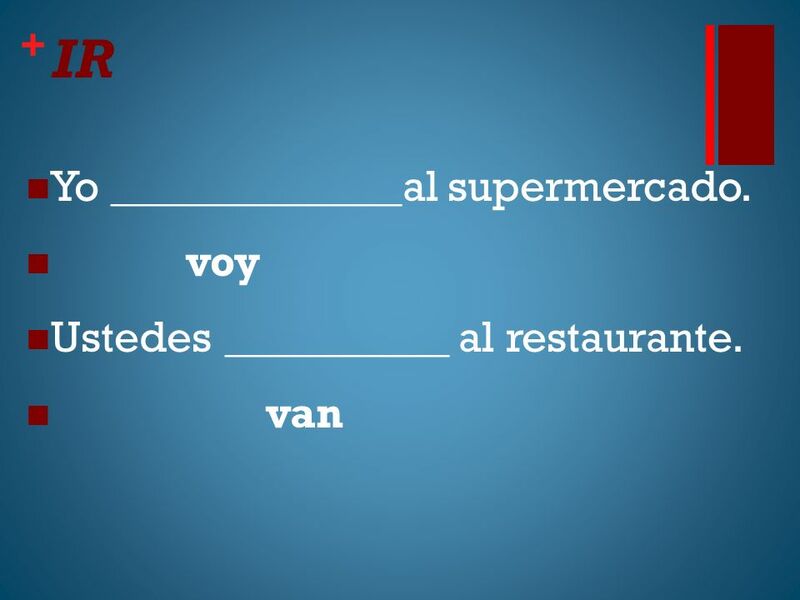 Vosotros (ir) a la cita. 5. 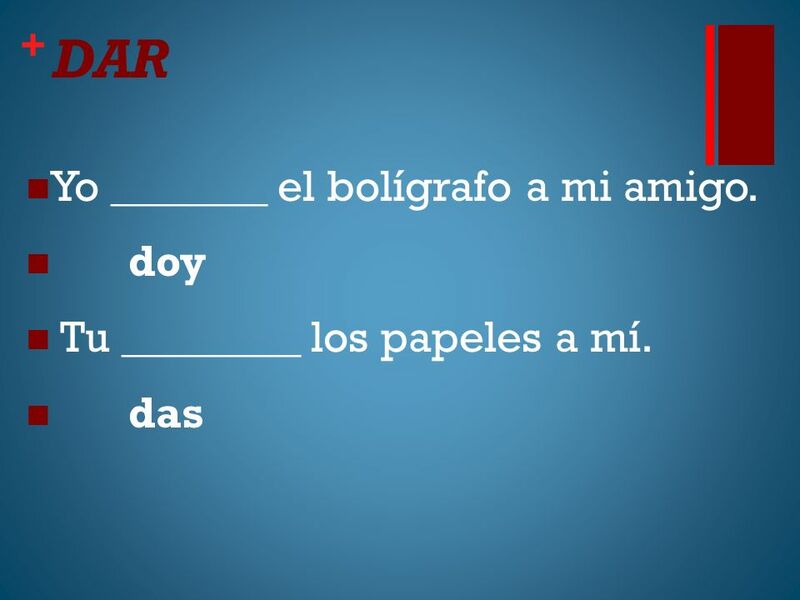 Yo (tener) dolor de el pie. 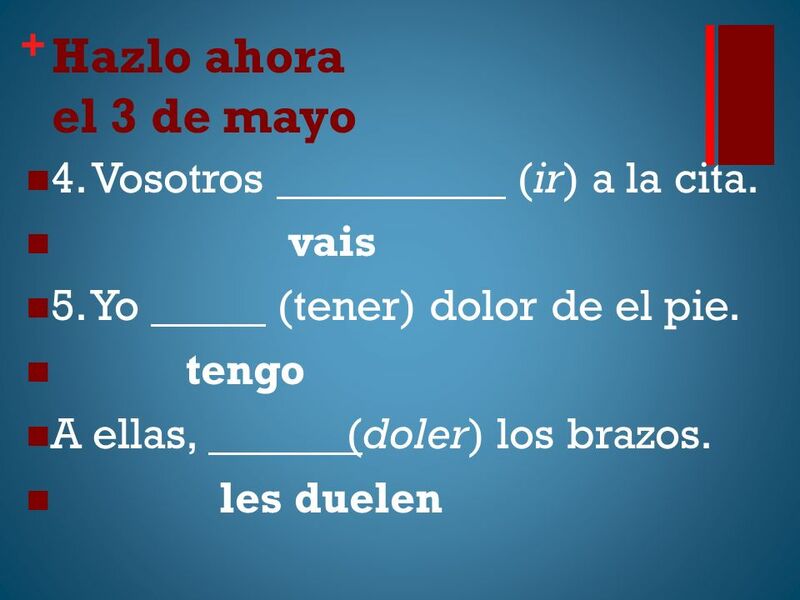 A ellas, (doler) los brazos. 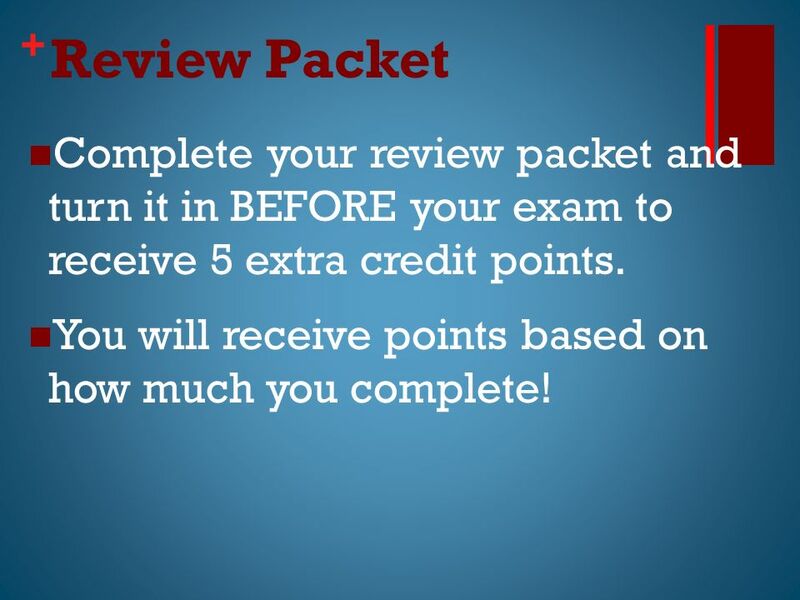 28 + Review Packet Complete your review packet and turn it in BEFORE your exam to receive 5 extra credit points. You will receive points based on how much you complete! 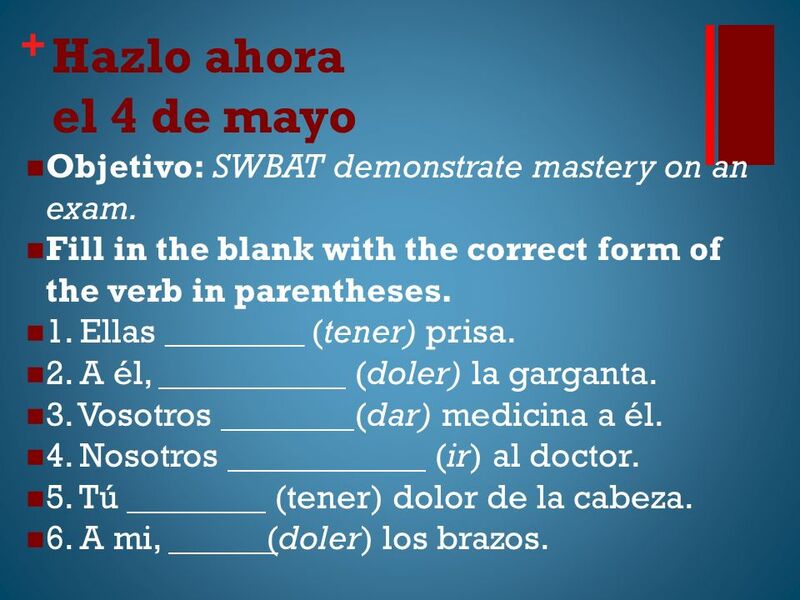 29 + Hazlo ahora el 4 de mayo Objetivo: SWBAT demonstrate mastery on an exam. 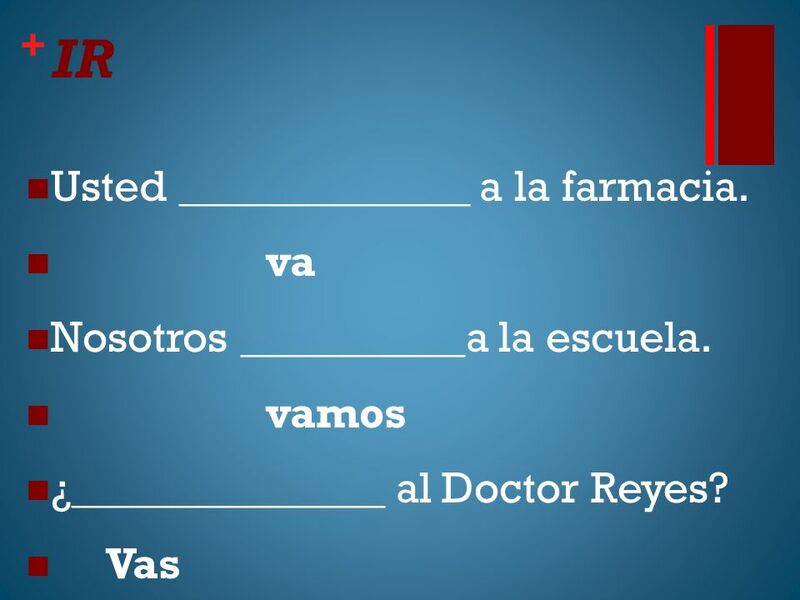 Fill in the blank with the correct form of the verb in parentheses. 1. 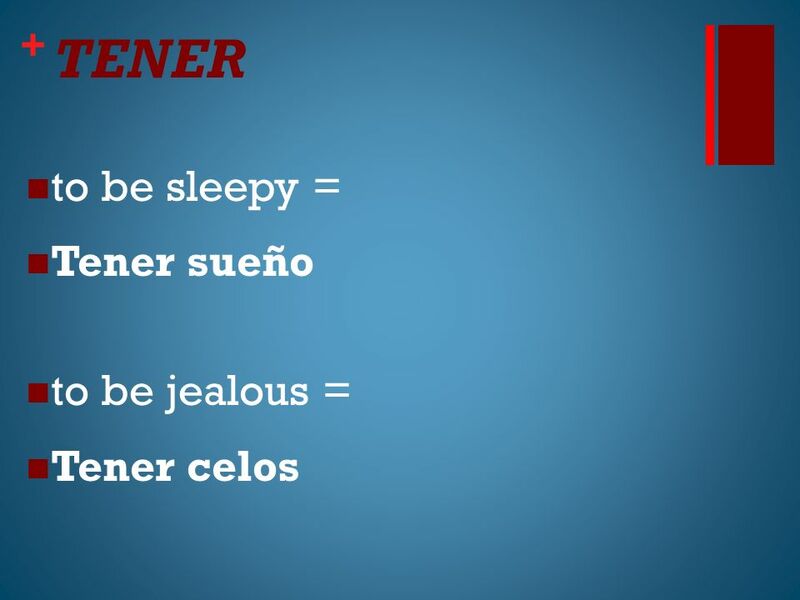 Ellas ________ (tener) prisa. 2. A él, (doler) la garganta. 3. 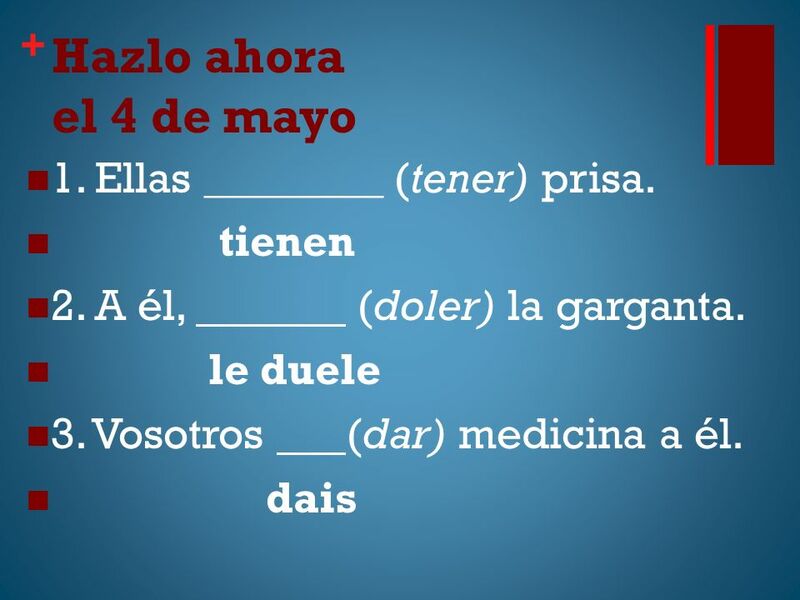 Vosotros (dar) medicina a él. 4. 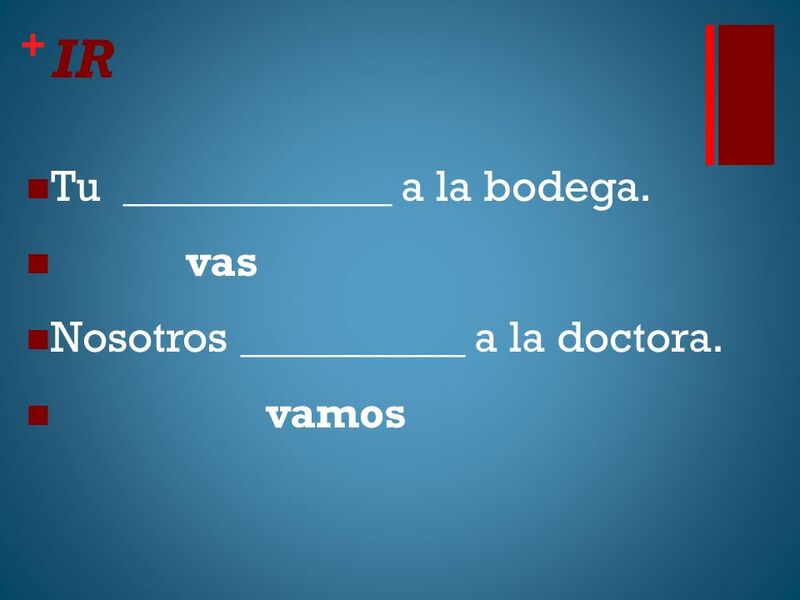 Nosotros (ir) al doctor. 5. 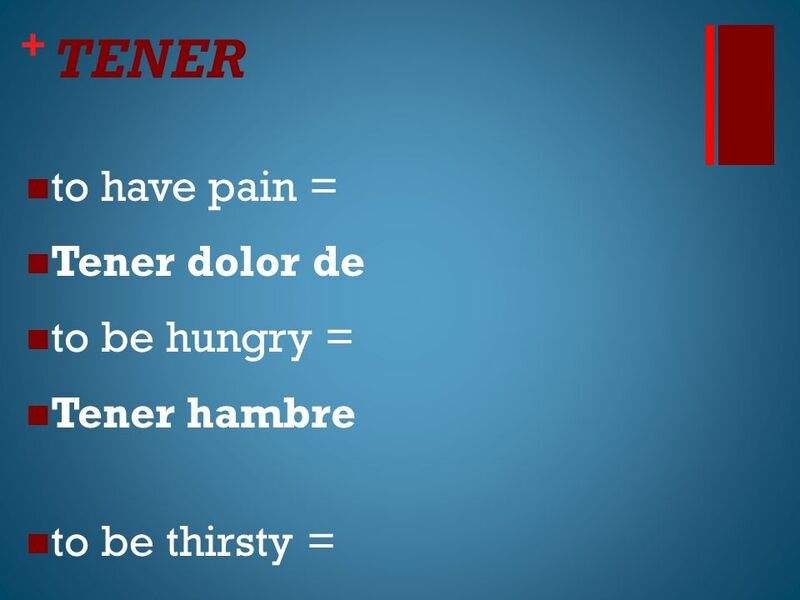 Tú (tener) dolor de la cabeza. 6. 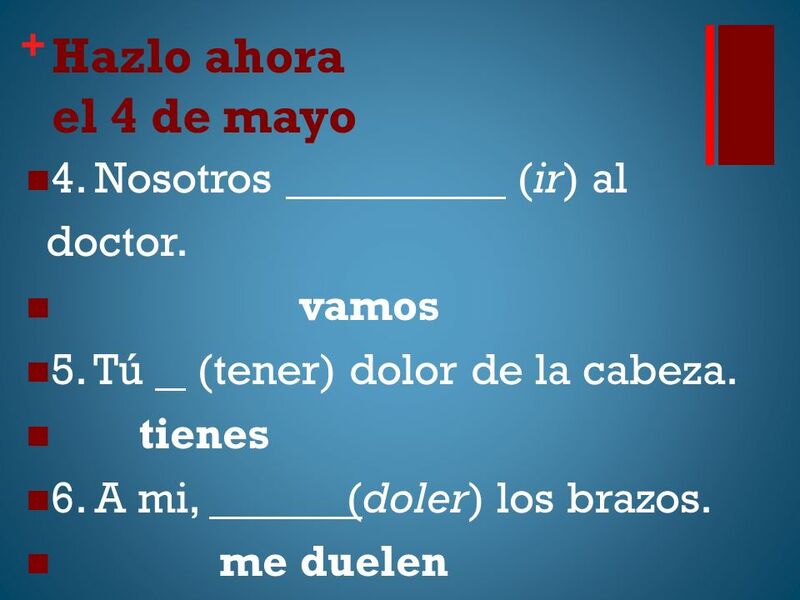 A mi, (doler) los brazos. 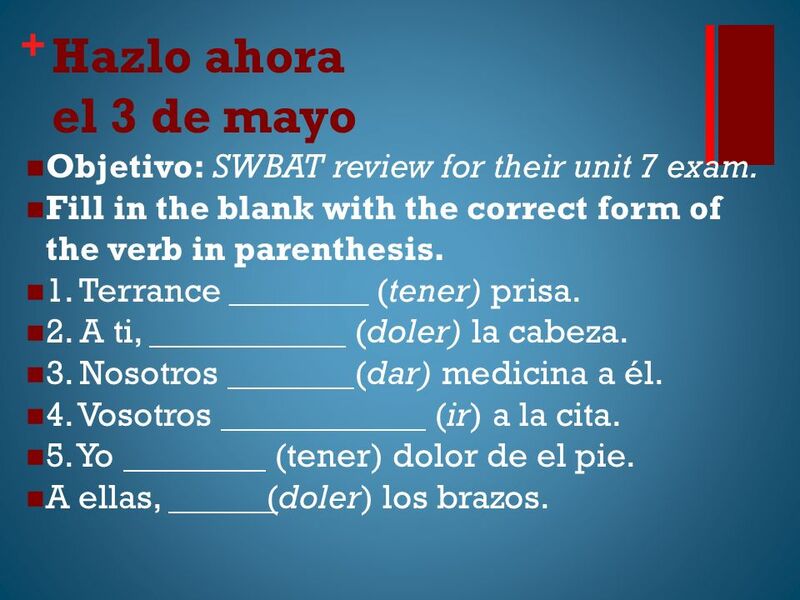 32 + El examen Take out your review packet to turn in for extra credit. 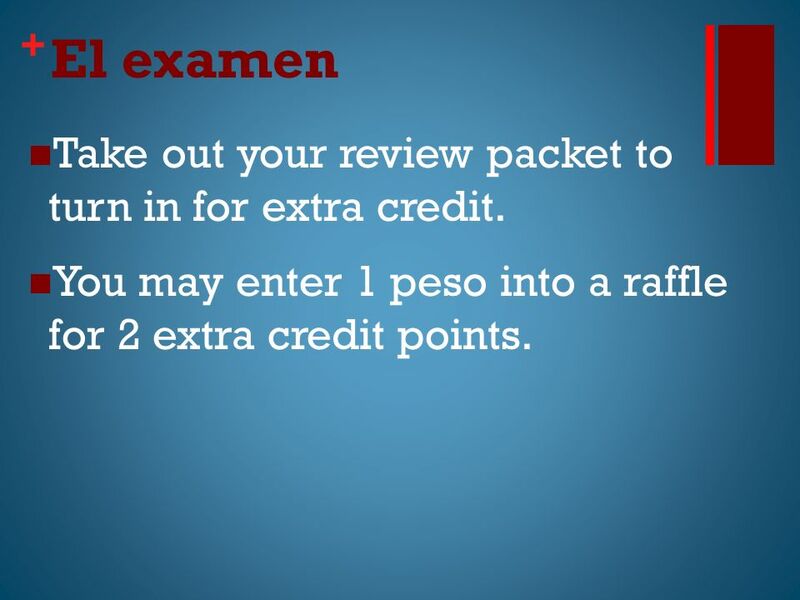 You may enter 1 peso into a raffle for 2 extra credit points. 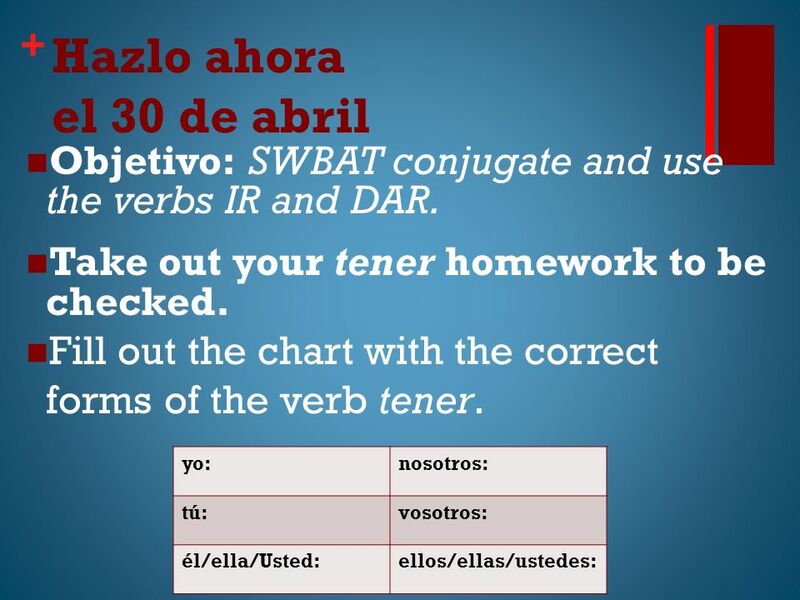 Descargar ppt "+ Hazlo ahora el 30 de abril Objetivo: SWBAT conjugate and use the verbs IR and DAR. 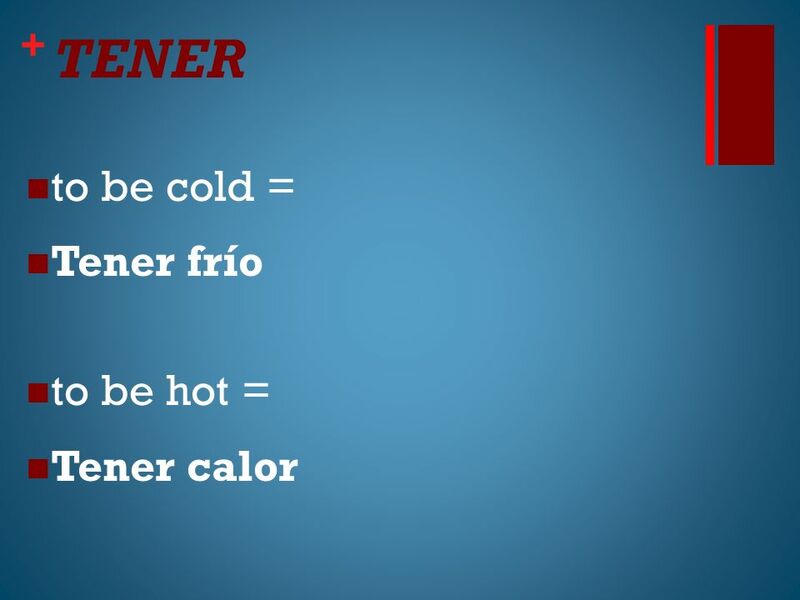 Take out your tener homework to be checked. 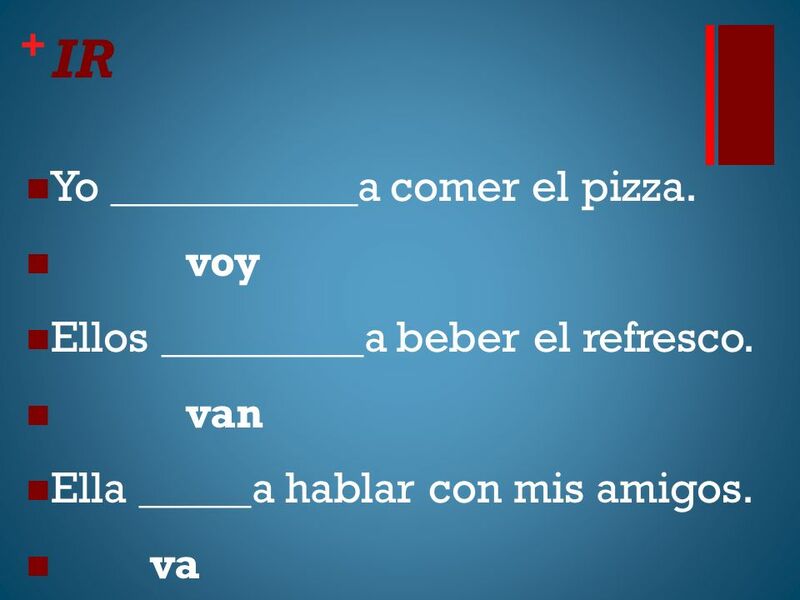 Fill out the chart with." 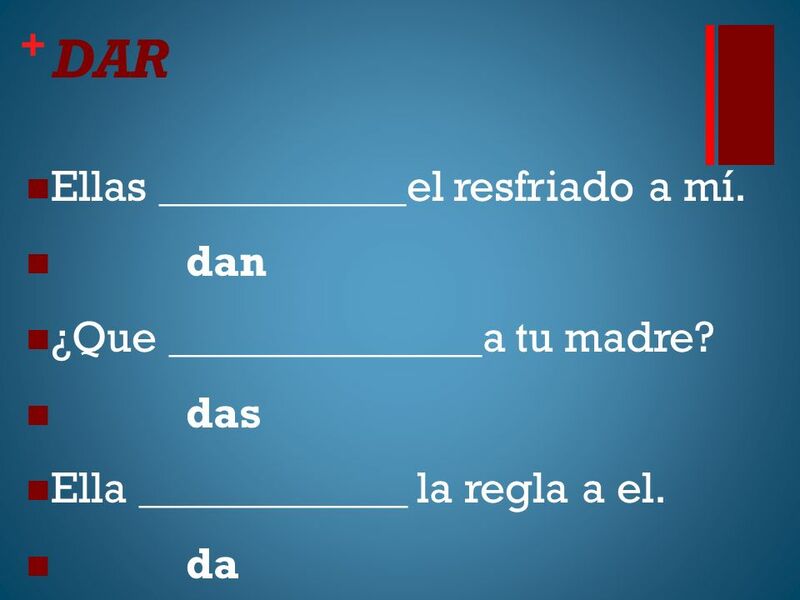 IR is an irregular verb. yovoynosotros vamos túvas ustedustedes élvaellosvan ellaellas. 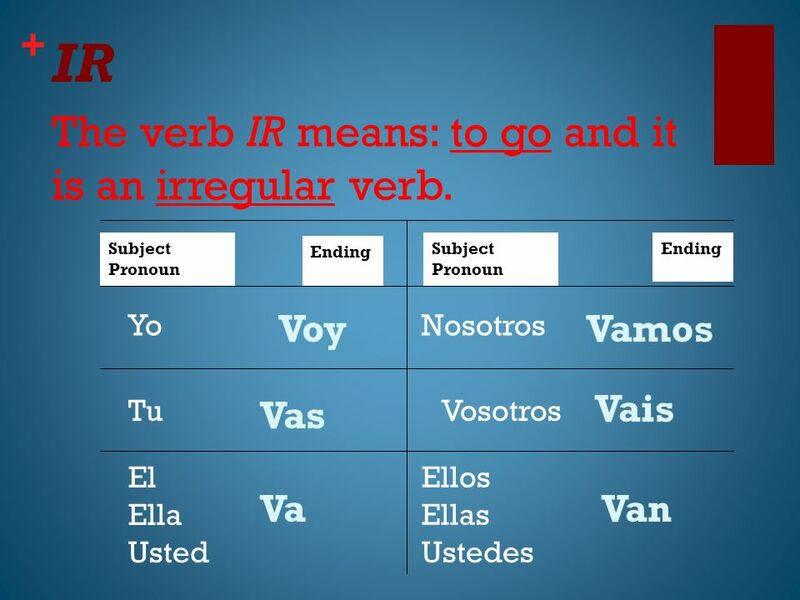 IR EL VERBO IR IR = to go IR = to go It is an irregular verb. 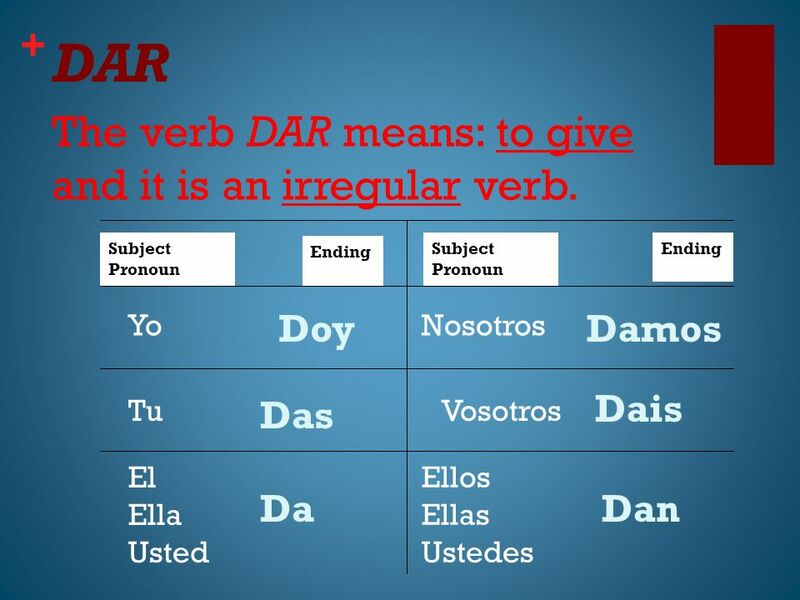 It is an irregular verb. 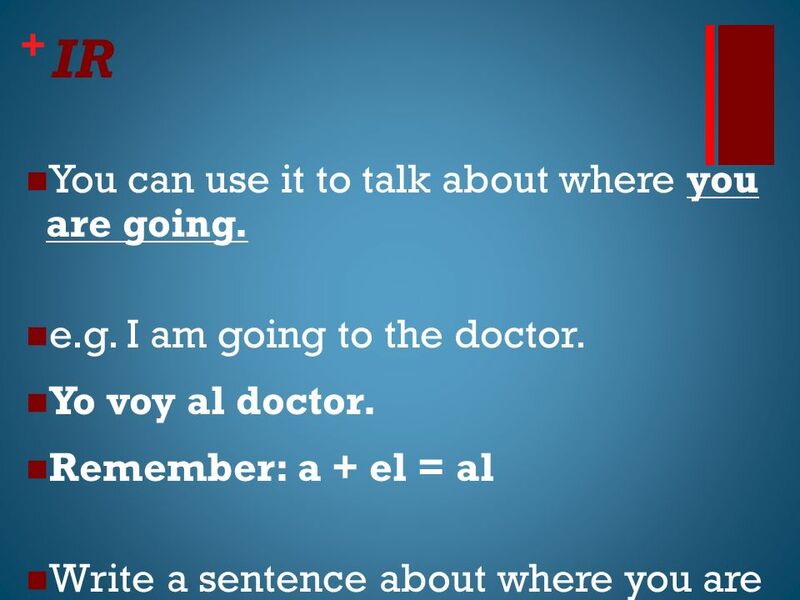 IR is the smallest infinitive! 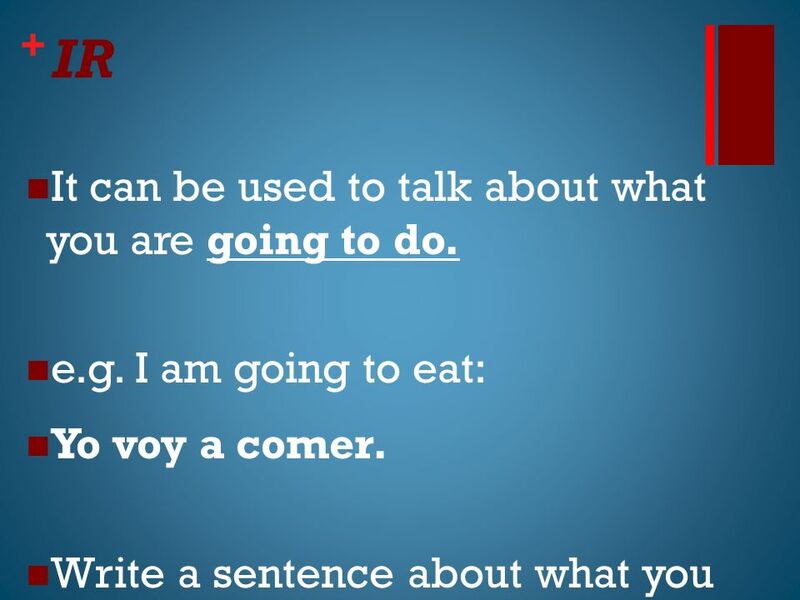 IR is the smallest infinitive!